Directors have been building trustworthy bonds with recurring actors long before all the contemporary hand-in-hand conglomerates that populate Hollywood nowadays. One of the more legendary of these pairings, of course, is that of Humphrey Bogart and John Huston, whose collaborations over their twelve years together range from enveloping adventures like The Treasure of the Sierra Madre and The African Queen to talky crime dramas like Key Largo that gravitated towards film-noir sensibilities. Then, there's The Maltese Falcon, Huston's earliest directorial effort and, obviously, the first time he and Bogie paired together, which serves as a genesis for both their adventurous tales and their endeavors into noir. In fact, it's the catalyst for Hollywood's fascination with the noir genre as a whole, though the breadth of its tonal scope -- existing as one of cinema's finest creations -- clearly doesn't limit its appeal to just genre appreciators. 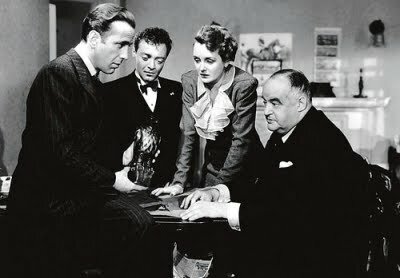 With Huston also as screenwriter as he adapts Dashiell Hammett's '30s detective novel in an Academy Award-nominated effort, The Maltese Falcon centers on private investigator Sam Spade (Bogart) as he makes heads-'n-tails about a motley crew of world-traveling hooligans out to find a gem-encrusted statue. A simple trail-'n-observe job quickly turns into a murder investigation after his partner is shot, lugging Spade in between high-rise buildings in San Francisco to sort out the details surrounding his client, Ruth Wonderly (Mary Astor). It's tricky enough to pry answers from Ruth's compulsive lying, later called Brigid O'Shaughnessy; but when smarmy Joel Cairo (Peter Lorre) and a ritzy, worldly "fat man" Kasper Gutman (Sydney Greenstreet) begin making high-dollar offers for Sam to bring them the statue, the actual reason why Brigid hired the detectives, Spade starts thinking on his feet and pushing buttons -- both to solve the case and to locate the statue himself. Like many films that ignite a trend or sub-genre, The Maltese Falcon projects the typographical points that have come to hallmark the film-noir genre in restrained, less-obvious ways -- especially when it comes to its aesthetics. Shadowy silhouettes, flashbacks, and reflective narration aren't too be seen or heard as Spade maneuvers about the city and interrogates his subjects, though cinematographer Arthur Edeson's capturing of high-contrast "chiaroscuro" lighting and skewed photographic angles do begin to outline that stylish veneer. Yet when the light pours into the Spade-Archer office and bounces off the billows of smoke and against Spade's pin-striped suit, it generates a mood that's impossible not to revel in from start to finish -- carrying an alluring, metropolitan spark that leaves the audience wanting more after the credits roll and the mystery finds a conclusion. It clearly shows off the vaulting points of film-noir's roots in Hollywood, as the Huston-Edeson combo coat the picture with an opaque, sophisticated finish. On the flipside, there aren't very many components at-play in The Maltese Falcon that fall in line with the era's crime-action pictures, like Angels with Dirty Faces, with little gunfire and even fewer scenes involving speeding cars -- none, even. This is a picture that moves from one smoky box of a room to another without guns being drawn upon every flinch, filling the walls with bigheaded archetypes of characters instead of rowdy, bold theatrics. Huston keeps the physical tempo low as scenes move from dimly-lit location to location, emphasizing the verbal and body language between the characters. Then, when guns actually are drawn by characters with dollar signs and desperation in their eyes, they're given a true sense of weight that veers from being flippant revolver-slinging melodrama. Its strategic use of these elements of danger are what continue the film's reputation as one of the period's earliest, and most elegant, triumphs in the detective-mystery genre. The Maltese Falcon makes its dialogue -- and the gradient of off-kilter, universally flawed noir-ish characters -- the paramount focus, creating jittery suspense in the many twists and turns that arise from simple verbal developments. Huston's meticulously labored-over script, both its furious rhythm and the razor-sharp stream of memorable dialogue, emanates a level of stylish craftsmanship that demands the audience's well-attenuated attention, though that won't be difficult to obtain. From the first conversation with Ruth in the Spade-Archer office, it becomes paramount to pay close attention to every thread and detail within the conversations, while also allowing their demeanors to speak louder than the potentially false content each character spews out. And it's all so wittily pleasurable to behold, all under the atmosphere of early-40s architecture and a few symbolic visual orchestrations. In that, The Maltese Falcon constructs exceptionally captivating characters, all of which gear towards the film's kinetic stratagems. When Peter Lorre slithers into Sam's office as the meek but unsettling Joel Cairo, reminding us of his unsettling place in Fritz Lang's M for a moment, he introduces the idea of true villainy around the hunt for the falcon statue through the eyes of a man utterly driven by its existence. Conversely, the conniving allure of portly kingpin Kasper Gutman, fleshed out by Sydney Greenstreet, reflects on a character that's as captivated by the item's existence, yet world-weary and elegant in his maneuvering to obtain it -- as well as respectful of its origins. His sly glances and carriage during the scene where he sits with Sam Spade and describes the falcon's history, all while observing the P.I. 's manner as he drinks a spiked cocktail, mesmerize with both the character's distinction and deviance. But Huston's take on Hammett's detective novel wouldn't be the enduring classic that it's become without Humphrey Bogart as the quintessential anti-hero, along the way he both manipulates and falls under the salacious manipulation of Mary Astor's femme fatale. 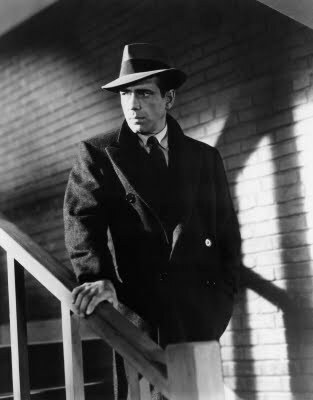 Carrying the momentum he generated from roles in Dark Victory and the John Huston-written High Sierra, Bogart neatly exudes the attitude of a cool, collected and ultimately acquisitive detective pushed to his limits with Sam Spade, falling into the quick-fire dialogue with observable shifts in his calmness. Within Spade's scheming, nickel-and-diming his assorted acquaintances and raising the stakes for his location of the falcon, he deftly balances both the noble and ostentatious sides of the character into one of the more three-dimensional entities in cinema. As Brigid tells lie after lie in rigid attempts to yank on Sam's strings like a marionette, the way he strategically alternates between conceding and walling up translates into a unforgettable string of situational exchanges between the two. Is it romance, or is it all a ploy? That might never be answered. The Maltese Falcon burns bright and hard for the entirety of its 100-minute span, concentrating on quick exposition and subtle-yet-punchy twists that lead into a thrilling conclusion which never leaves the confines of a single room -- for the entirety of thirty or so minutes. There, the crew of cutthroats, strong arms, detectives and manipulators all gather in a whirlwind of plot illumination and crafty double-crossing embedded with skillfully assembled dialogue, simmering and itching to pull the trigger on the opportunity to obtain the falcon for mixed motives. Yet that's one of the most intriguing things about Huston's film: we're never allowed to see the bird for ourselves until it's absolutely necessary, which emphasizes the figurative ground that the film predicates on -- and why Spade's "the stuff that dreams are made of" line endures as a classic, meaningful trope delivered from the cinematic world. They're all warring over the idea of holding the statue in their hands, of victory, showing how the drive to obtain the near-obtainable can consume, inspire, and ultimately destroy those devoted to it.